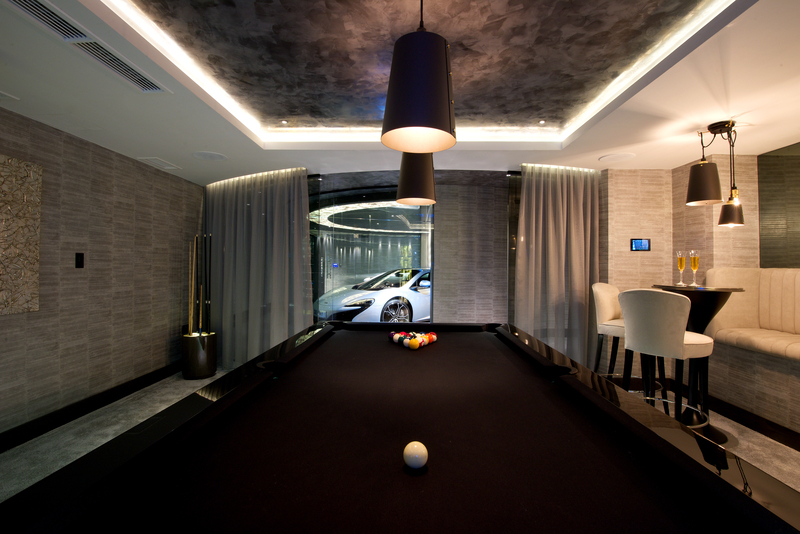 This week’s instalment of the #SBIDinspire interior design series features the ultimate luxury man cave! 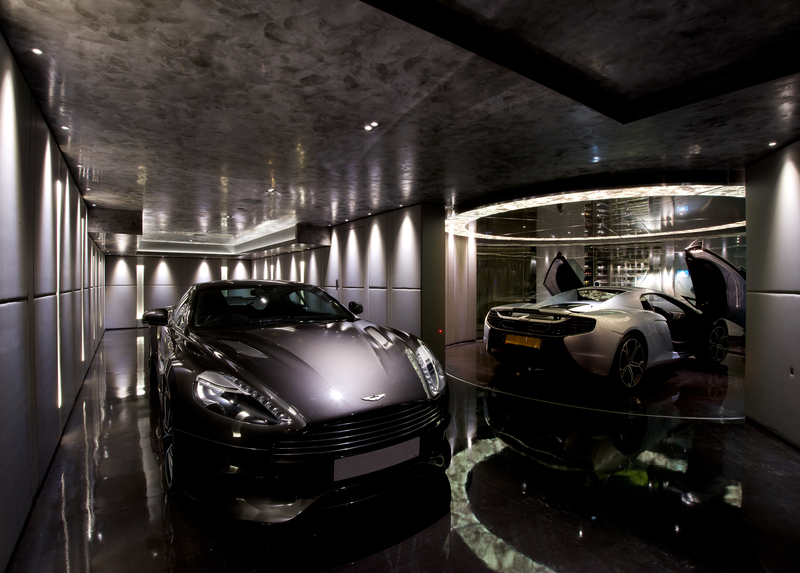 The dark, sultry and masculine design of this glorified garage was built to house the client’s invaluable collection of sports cars. The space now embodies the essence of a moody underground club, doubling up as a sanctum of entertainment where the client can play pool in the glamour of a subterranean bar. The project evolved to include a plethora of cutting-edge technology. Every carefully considered curve and specially selected surface, combined with the un-apologetically flashy and unmistakably contemporary design, has managed to transform what used to be an uninspiring driveway into a gallant showcase of masculinity, impressive enough to rival any Hollywood-style superhero garage. We think this project would give the likes of Tony Stark a run for his money! What was the clients brief? Following the completion of the main house and its enjoyment for a year or two the client realised that there was a fundamental piece of the jigsaw missing from the lifestyle he had created. Looking out onto the driveway hinted at the missing component. The client’s collection of sports cars sat on a driveway in the affluent south Manchester suburb where the weather was not always as pretty as the cars themselves. The cars were isolated, hardly ever garaged as a result of an awkward entry point to the garage itself which involved reversing back up a steep driveway to get the cars out. From within the blank canvas space there was the usual hoarding of garage paraphernalia and wheelie bins to negotiate and for remodelling consideration there were some fundamental construction obstacles to overcome. Not least there were two huge structural columns which were positioned awkwardly in the space. The floor to ceiling heights were already on the low side and yet we needed to get air conditioning and fresh air into the space. We then had the challenge of allowing for the cars to turn and enter and exit the space comfortably (rather than reversing up the drive) as well as providing a break between the garage space and living space that met with building regulations. 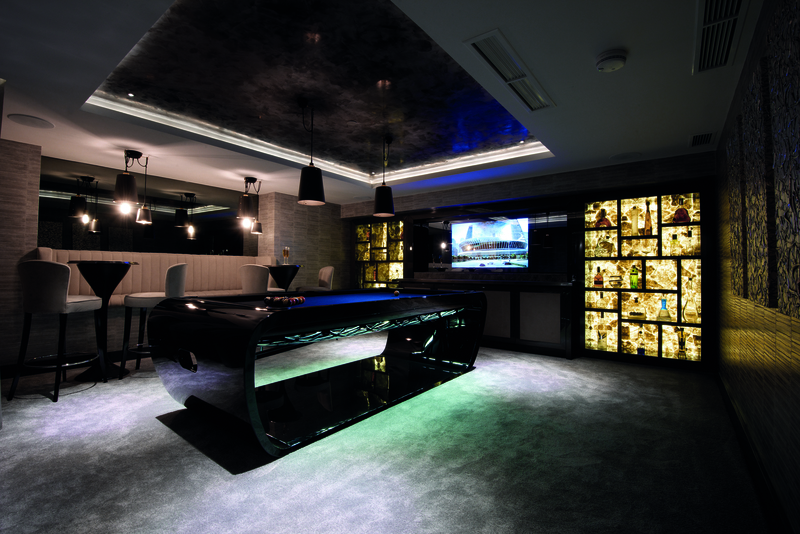 The wish list then evolved to include a moody underground club feel entertaining space where the client could play pool in the glamour of a subterranean bar and watch the football with his mates. 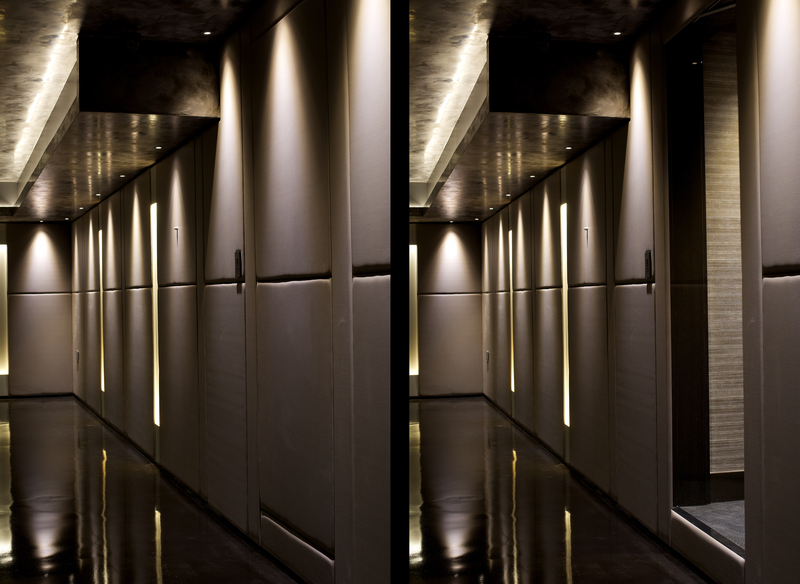 He wanted the space to feel like an exciting break from the every day and quickly caught the technology bug desiring to push the boundaries within a tight pre-built space wanting luxury, intrigue and showmanship. 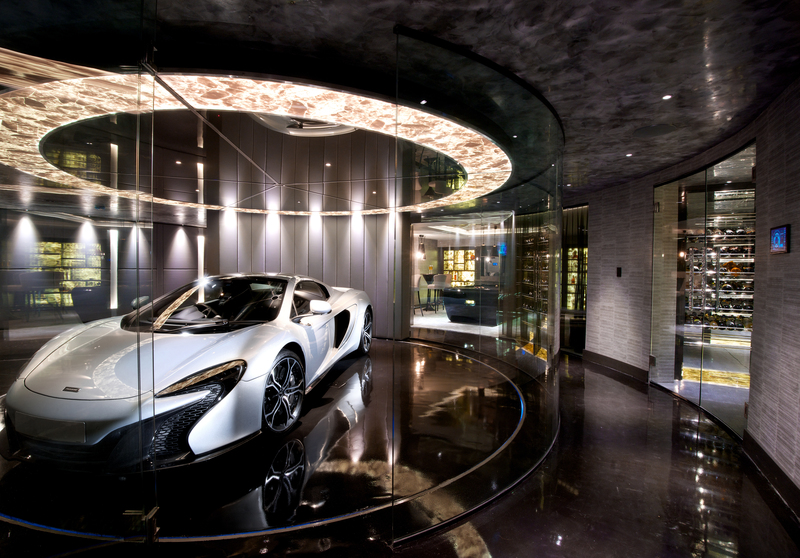 The Design Practice by UBER set about creating a car ‘trophy cabinet’, to take the very finishes from inside these stunning vehicles and translate them onto the walls of the garage together with some bespoke hotel inspired materials. The client loved our initial concept including a turntable to showcase his showcase sports cars and allow them to be rotated in a small space, making it also extremely practical. The brief quickly evolved to include a plethora of cutting-edge technology to rival superhero garages from a Hollywood blockbuster. The circular ceiling feature that sits above the turntable was a masterpiece in design and engineering in itself. Weighing over a ton and being suspended from a heavily clustered ceiling full of pipe work and cabling, it needed a great deal of thought. 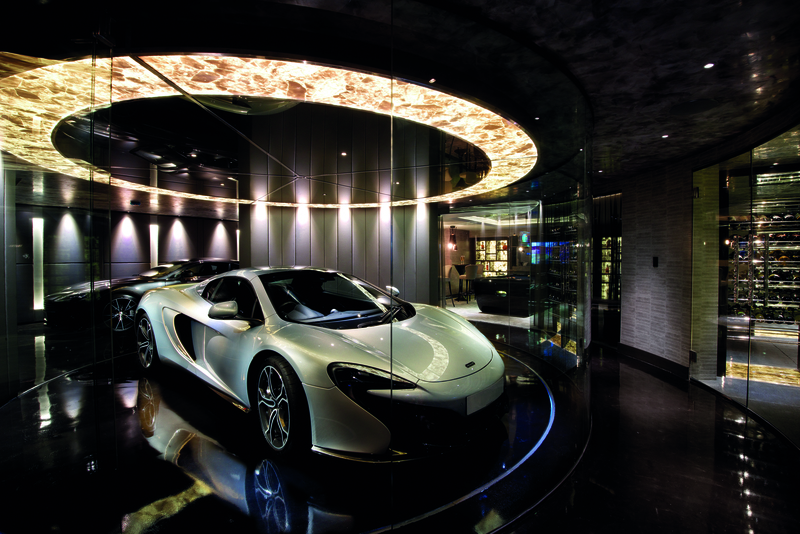 In the design intent it was critical that we achieved a glow from the amber back-lit precious quartz that we had set our hearts on using together with a smoked mirrored central section to show the car off and reflect across the roofline. However, the weight of the stone was substantial and proved a problem for use in the ceiling detail as well as the fact that the waste material would have been enormous. We managed to get the slabs of the precious stone to site and once correctly illuminated we photographed the pieces and then printed the high resolution image onto lightweight acrylic to use on the ceiling section. 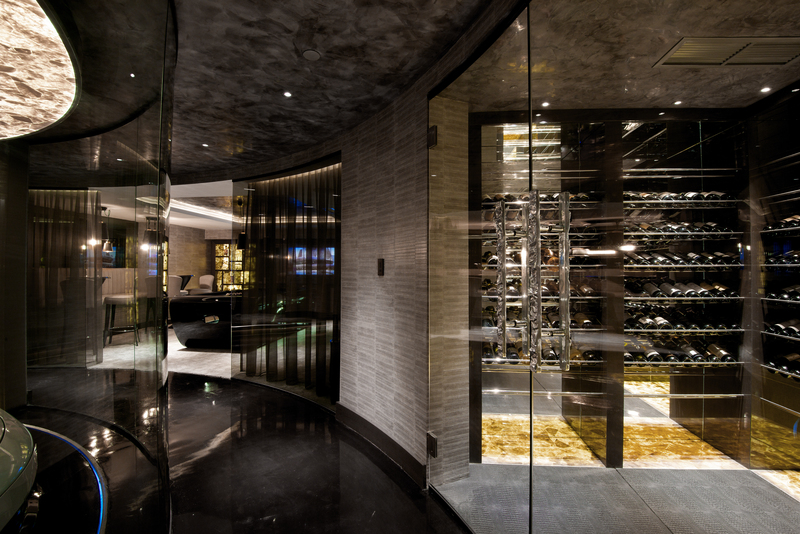 This was highly successful and the faux material works harmoniously with the real precious stone in the bar and wine cabinet areas, something that would have been almost impossible to achieve had we not photographed and used the same pieces. The enthusiasm of the client was evident throughout pushing us to bring together services at the very cutting edge of technology. 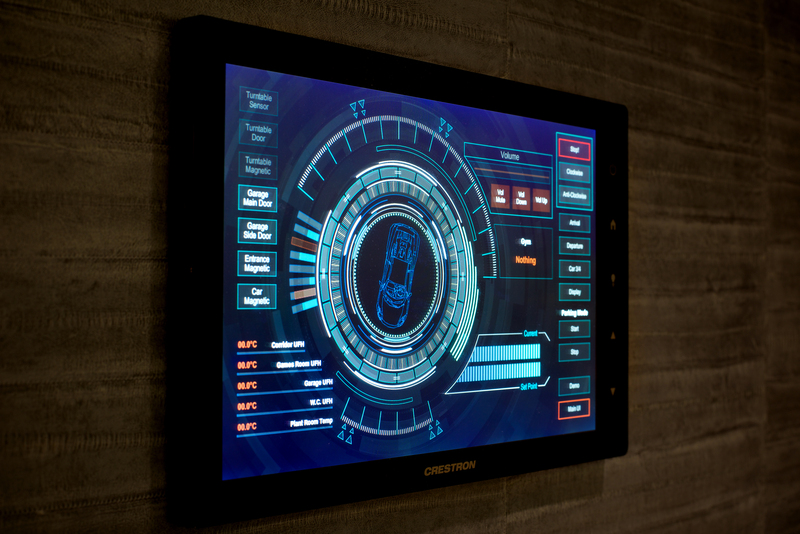 The car turntable was designed to be controlled by custom designed Crestron wall panels to create a bespoke “man-cave” feel. The system shows the exact rotational position of the car on the turntable. With a simple swipe, the car can be rotated to specific angles to show off its best side in a pre-set positions or simply spin 360° for “look at me” appeal. And when the system is not in use the vehicle will always come to rest pointing outwards, towards the garage entrance for fast drive away convenience. Due to sensors in the car and driveway, as the homeowner simply approaches the home’s lighting, heating and music systems fires into life matching the predetermined preferences of the particular car that has arrived. There are sensors on every door within the man-cave, which not only enhance safety (the turntable won’t operate if the door is open), but also notifies the owner if the wine cellar door is left open. 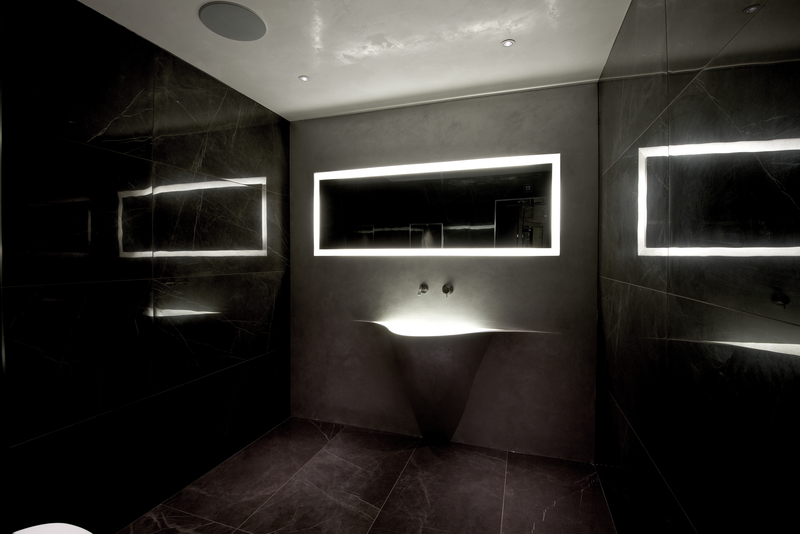 The lighting scheme has been carefully considered to work with all the contrasting surfaces to give the most dramatic impact possible to this moody space. From the shiny and reflective surfaces of floors and polished plaster ceilings, to the soft leather paneling and backlit quartz pops of colour. Along with the industrial decorative drop lights, each aspect of the lighting was crucial in bringing this theatre spectacularly to life for the most incredible impact possible. As an esteemed society within the industry, the SBID awards are hugely influential for awareness and recognition to a global audience. As a long-standing member we look forward to submitting our projects which allows us to realise, each year, how our esteem peers push us forward to achieve greater things. If you missed last week’s Project of the Week with a lavish and tranquil family home based in Kuwait City, inspired by a vast collection of Middle Eastern treasures, click here to see more. Entries were received, finalists deliberated and the winners of the SBID International Design Awards 2017 were announced! Click here to see the full list.